Landlords throughout Metro Vancouver are increasingly exploiting a loophole in the Residential Tenancy Act by getting tenants to unknowingly sign Fixed Term Tenancy Leases, making it easier for them to evict tenants without proper due process and raise the rents above the yearly maximum. A sharp rent increase or eviction has devastating effects for all of us, but especially severe impacts on low-income folks who as a result may become homeless. 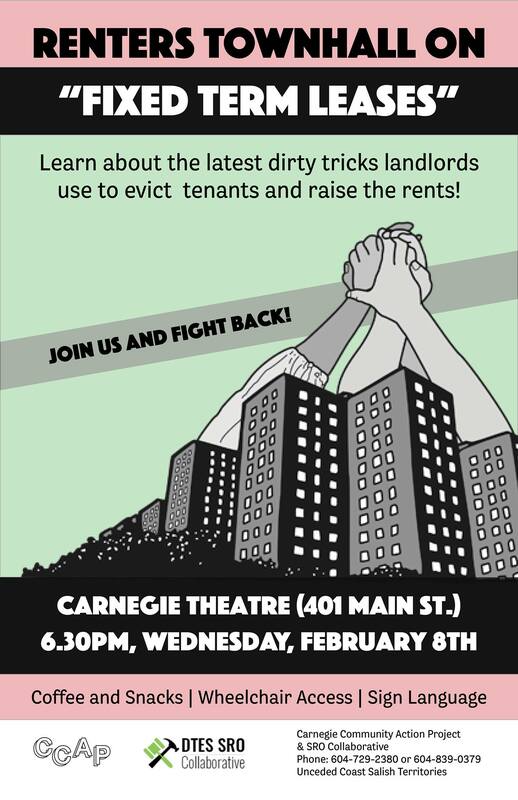 We must join in solidarity and fight for tenant rights! Learn what you are signing in a lease agreement! Learn how to respond to an exploitative landlord and seek justice! Help us lobby to close the Fixed Term Tenancy loophole in the RTA! Organized by DTES SRO Collaborative and The Carnegie Community Action Project.